On the face of it, the entire debate surrounding whether Star Wars’ technology is superior to Star Trek’s is ludicrous. The most common distinction made—by people who don’t want to involve themselves in the lasers vs. phasers debate—is that the former is science fantasy, the latter science fiction. Nevermind that Star Trek’s science is often a very powerful form of handwavium, Trek’s universe is one bound by a set of rules at least nominally based in earthly scientific theory; Star Wars is considerably less so. But debate we do, because we can, dammit. Plus, it’s a lot of fun, as this trailer for an imagined 1985 Trek/Wars mashup “The Carbonite Maneuver” shows. 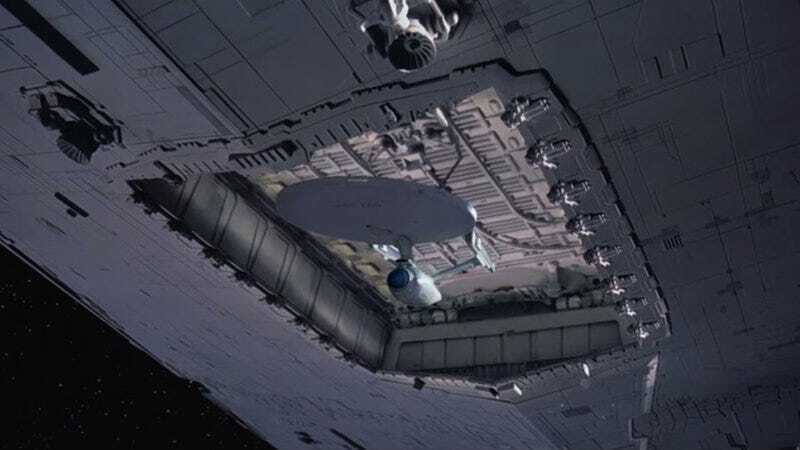 Just don’t ask how the USS Enterprise fits into the Death Star’s trench. It’s probably The Force or something.